In addition to actual farming and farm-based workshops, each Youth Farm season combines field trips, nutrition education, community service, and entrepreneurship to create a richer educational and life experience for each of the participants. Youth Farm Amazing Race—On the second day of the summer program, all youth gather at the Lake County site for a day of farm challenges and team-building activities, setting the stage for a season of fun and hard work. 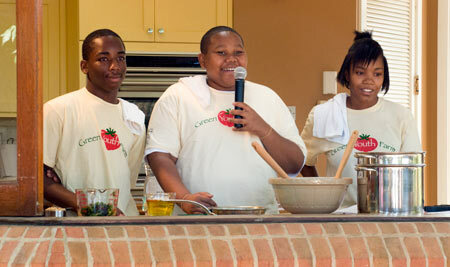 Youth Farm Top Chef—During a visit to the Green City Market in Lincoln Park, youth are divided into six “families” and challenged to create their own lunches from local, seasonal food on a budget. Youth bargain with farmers, work with limited resources, and create delicious smoothies, salads, and paninis from scratch in the park! Youth Farm Apprentice—Midway through the season, all sites converge at the Chicago Botanic Garden for a day of career exploration. Youth are split into teams and challenged to interview at least five different employees at the Garden. Teams have interviewed horticulturists, librarians, chefs, plumbers, writers, and event planners! The day culminates with a “Dating Game”-style skit in which a Youth Farm job seeker picks the best career for him/her. The Great Food System Debate—At the end of the summer season, all farms join together at the Washington Park site to debate different aspects of the conventional food system vs. sustainable food systems. Every student presents his/her case on the topics of the economy, the environment, world hunger, and public health. “[The program] helps me make healthy choices and helps me learn how to grow other healthy foods in order to maintain a healthy lifestyle." The Youth Farm carries the Chicago Botanic Garden’s mission—to cultivate the power of plants to sustain and enrich life—into neighborhoods, while creating access to high-quality produce in low-income communities and encouraging healthy lifestyle choices and habits. Community Lunches—As a key component of the Youth Farmers’ “edible education,” every crew gets the opportunity to cook a lunch for their entire site using the farm fresh produce they’ve grown. These lunches are extremely popular—they not only promote healthy food choices and pride in food preparation skills, but also reinforce the importance and joy of sitting down together to share “family” meals. Get Healthy Goals—Throughout the season, Youth Farmers learn the importance of healthy lifestyle choices such as drinking water, interpreting food labels, getting enough sleep, and getting enough physical activity; they practice these habits on the farms. Each farmer challenges himself or herself with a “Get Healthy” goal to strive for during the day, week, and throughout the season. Crew leaders track progress toward these goals on a chart and award achievers with “kudos” and extra incentives that encourage crew members to meet their goals for an entire week. Healthy Snacks and Lunches—Access to healthy, consistent meals means smoothly functioning farm sites and productive farmers. Providing Youth Farmers with nutritious breakfasts and daily wholesome lunches results in summers with no heat-related illnesses, a general positive mood on each farm site, and increased consciousness about the importance of eating regular, healthy meals and trying new ways of cooking and eating. 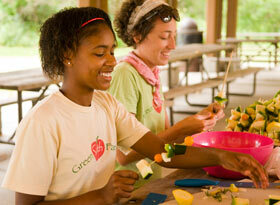 This is particularly important for youth participants who do not have regular access to wholesome food at home. Food donations—Youth Farmers donate a significant amount of produce to community food pantries each season. This is particularly important as pantries struggle to provide more fresh options to their clients. 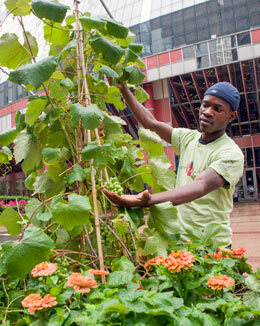 Garden assistance—Youth Farmers assist with community gardens in their neighborhoods, providing expertise and physical labor, which is particularly important for older community members who are trying to maintain gardens in the neighborhood. Food education and distribution—The Youth Farms partner with Women, Infants, and Children (WIC) service providers, including the Lake County Health Department, the Community and Economic Development Association of Cook County, Inc. (CEDA), and Sinai Health System to increase awareness of, and access to, fresh produce for the youngest neighbors, from newborns through 5-year-olds. Each week, Youth Farm crews perform straightforward cooking demonstrations and nutrition education for WIC nutrition education classes, using the produce they have grown. Following the presentation, Youth Farmers provide a generous variety of farm fresh ingredients from the cooking demonstration in addition to in-season produce in a market basket, complete with recipes on how to use the included produce. WIC mothers can redeem their Farmers’ Market coupons right then and there, reducing the strain on their limited transportation budgets and time. Through their work at the farm, Youth Farmers are exposed to issues of food and social injustice and discuss how to combat these issues with entrepreneurship. While the demand for local, seasonal, and sustainably produced food has increased exponentially over the past decade, access to fresh produce is still a challenge for many Chicago residents. Youth Farmers are empowered to overcome this challenge through growing, harvesting and then selling fruits and vegetables in the communities where they live, many of which are food deserts. More than 61 percent of the produce grown at the Youth Farms is sold to community members who use federal benefits such as the Supplemental Nutrition Assistance Program/Link, senior Farmers’ Market coupons, or WIC Farmers’ Market coupons to purchase the food the Youth Farmers grow. 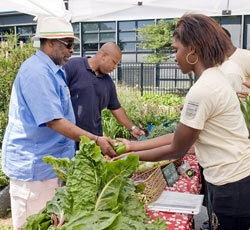 Youth Farmers also distribute their produce to local “healthy” corner stores that have opened throughout the city. These Youth Farmers establish relationships with their customers, members of their community who visibly value the product of their hard work—enough to spend limited resources purchasing it. These are invaluable experiences that last a lifetime. For more information, contact Eliza Fournier, Urban Youth Programs director, at efournier@chicagobotanic.org, or (847) 835-8352.